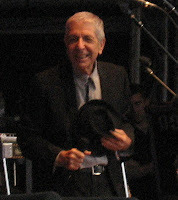 Leonard Cohen at The Vineyards at Bowral. Big natural amphitheatre surrounded by gum trees and grapevines. Lots of grass, shade, space to stretch out on the blanket; kids everywhere, no agro or boofheads or drunks. On stage this amazing, gentle man with a resonant voice and a wonderful stage presence, singing songs from my past . We left early towards the end of the second half, just after Hallelujah, to beat the traffic jam and because the lad had fallen asleep despite the music and the light rain. After months of juggling work and shows and who is where, doing what, we finally got to go on a holiday. We took the weekend off because we had a new toilet installed courtesy of a very generous offer from the Sydney Water board and we couldn't use the loo for 24 hrs. and a visit to Bombo Headland for the first time. I had seen this dramatic and exotic scenery on various music clips and vintage shows like the Power Rangers and The Aunty Jack Show but it is a lot prettier in real life. After all too brief day on the coast we headed inland to The Centennial Vineyards at Bowral and the Show I had bought tickets for way back in november '08. Well worth the wait. Thanks Katie. I've been reading such wonderful reviews of LC. Makes me wish we had got tix, but we were so deep in house stuff at the time we couldn't imagine having enough energy to go. Glad you had a good weekend. It's funny how you don't see what's in your back yard until someone else presents it as being beautiful. We spent lots of time as kids at Kiama and Bombo beach. They seem so ordinary to me, but you made me think of them in an extraordinary way today, so thank you!